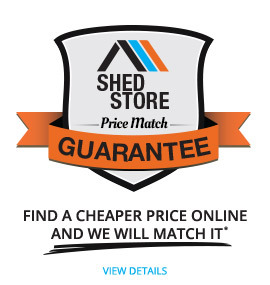 Get your storage needs sorted with ShedStore. Feel free to browse our wide range of garden sheds, garages, workshops, aviaries, carports and more available throughout Australia. Whether you are looking for a shed to store your gear, your car or your tractor, we should have something to suit your requirements. With our Price Match Guarantee* you will find a wide range of kit set products available for purchase online at a great price. We offer Free Depot Delivery across Australia for most items and also offer home delivery options. Garden Sheds - Large selection available, ranging from single door slimline units all the way to full garden shed workshops available at extremely competitive pricing. Garages - Perfect for cars, trailers, boats and workshops. Carports - We offer a variety of carports, including both single and double gable roof, flat roof and skillion roof. Patio Covers - Add shelter to the side of your house or shed with these east to assemble kit sets. Aviaries - A must have shelter for birds, chickens and other pets. Pool Pump Covers - Great for keeping those unsightly pumps and pool accessories out of view. Our team are more than happy to help! If you have any questions, feel free to contact us here, or leave a message in the chat box (lower right side). All products come with a Manufacturer Warranty. See product specifications for more information.